Please join the Financial Literacy and Economic Justice Conference's organizers in our celebration of Financial Literacy Week, from April 8-12! 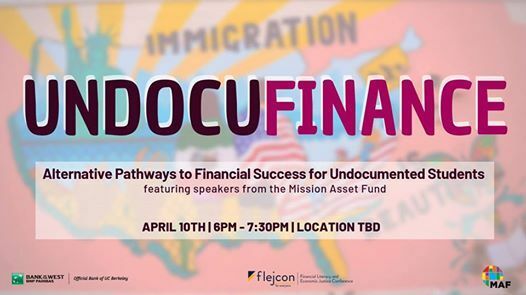 On Wednesday, April 10, from 6pm-7:30pm, we will be focusing on financial literacy for our undocumented student community. Location is to be announced-- so please click "Interested" or "Going" to receive updates! Featuring Joanna Hernandez from the Mission Asset Fund, this workshop will explore the unique problems that undocumented immigrants face in navigating the financial system, as well as provide information on how undocumented students can take steps to overcome these obstacles and achieve long-term financial wellness through alternative community resources. We invite you to share this page with your friends, student organizations, and classes!